SIGN UP FOR THE GOLDEN BOY NEWSLETTER TO RECEIVE PRE-SALE OFFERS, CHANCES TO WIN AND MUCH MORE! Andrew "El Chango" Cancio (19-4-2, 14 KOs) of Blythe, Calif. hosted a media workout today at Westside Boxing Club in Los Angeles ahead of their 12-round battle. The event will take place on Saturday, Feb. 9, 2019 at Fantasy Springs Resort Casino in Indio, Calif. and will be streamed live on DAZN - which is just $9.99 per month after a one-month free trial. Four fighters from the undercard also participated in the workout. Joseph "JoJo" Diaz Jr. (27-1, 14 KOs) of South El Monte, Calif. will return in a 10-round super featherweight battle against Charles Huerta (20-5, 12 KOs) of Paramount, Calif. Genaro "El Conde" Gamez (8-0, 5 KOs) will battle against Ivan "Striker" Delgado (13-1-2, 6 KOs) in an eight-round lightweight battle between a current Golden Boy prospect and an ex-Golden Boy fighter. "Being a father is one of the most important things that has happened to me. Now I dedicate my time off to being a father, to being a family man. I'm boxing full time, but it's an extra motivation because I want to provide the best for baby. That is one of the reasons I'm in Los Angeles working hard for six weeks in camp without my family. I'm ready to defend my title." "I hope to fight four times this year and make four defenses. I am very excited for all that has been happening in my career. Thank you to Golden Boy Promotions and Miguel Cotto Promotions. I'm very happy for all the opportunities." "I am big for this division. I'm tall. I have power, and I have speed. Cancio is a great warrior. I'm ready to defend my title. It's another challenge in my career and I'm happy for this opportunity. Training camp has gone well. Freddie Roach is a great trainer and a great person. He has more time for me now, and I'm getting a lot of experience from him every day. I feel and see the difference in my fights and my sparring. Everyone who saw my last fight saw that I did better. I will continue that momentum in this fight." "DAZN is the new platform for boxing. DAZN has a lot of fighters now. Boxing is going through a great time right now. If my promoter gives me the opportunity to unify the titles--it would be a dream come true. I'm waiting for that opportunity this year on DAZN. I may even close the year in the lightweight division as well." "It's very surreal to be fighting for a world title. I thought my career was done. I took a tough loss in my first pay-per-view fight [against Joseph Diaz in 2016], and that wasn't good at all. I told my best friend I was going to retire. It took 17 months for me to get back in the ring. I missed the sport. I also had a lot to prove. But I knew that I could be here. I knew that I could fight for a world title. I finally got things in order. I won some fights that people thought I would lose, but here I am. I'm looking to do the same thing February 9." "Life changed me. I got hit with some things that I had never seen coming. I guess it humbled me and changed me as a person. I became a different person. I didn't take things for granted anymore. I had to come back and do things right this time around." "I feel great now. I feel like I'm a different fighter than the one who fought JoJo Diaz. This is a big deal. This is for a world title. It's not my first time being on the big stage, but it's the first time I'm the main event on the big stage. But I feel prepared for this. It's my time." "For this fight we will have to work on the inside. If we let him get his range, he will get more leverage. He will get more powerful. They say he's a big 130-pounder, but I've won all my best fights at 130. When I fought Jerry Belmontes, it was at 130 and I won clearly. When I fought Aidar Sharibayev, it was at 130. When I beat Rocky Juarez, it was at 130. I'm glad that this opportunity at 130. This division will benefit us." "I always bring action to a fight. The fans can expect me to be in good shape, mentally and physically. I will be ready to go all 12 rounds. But he's a hard-hitter, and so am I. So, I don't think this fight will go to the scorecards. Whether it's me or him going down, we will collide. The fight fans will win that night no matter who walks away with the victory." "I took 2018 as a learning opportunity. It was a year where I had to learn and fight through adversity. I fought Gary Russell Jr. in my first world title opportunity [and came up short]. Then I came back for my second opportunity and didn't make weight. It was hard for me. It was a heartbreaking year. Ever since I was kid, I was dreaming to become a world champion, and it didn't happen that year. I was very heartbroken, and I was depressed for a long time. But at the end of the day I just had to keep having faith in God and know that everything happens for a reason. I just have to keep pushing forward because I'm a strong-minded person. I know my worth and skill level, and I know what I'm capable of doing. As long as I work hard, everything else will fall into place." "Now I have this opportunity to fight on Feb. 9 on DAZN. It's against a very strong opponent in Charles Huerta. I'm ready to show that I'm back and that I'm ready for all the opportunities that are put in front of me." "I moved training camps [to Indio, Calif. with Joel Diaz] to get a different look, a different feel. I was getting too comfortable training at the same place for years. I had been training there [at Teamsters Boxing in South El Monte, Calif.] my entire life, and there wasn't that spark there anymore. So, I ended up telling my manager [Ralph Heredia] and my dad that I still want my dad still in my corner because I trust him and he's a great trainer. But I also want to get a different feel and hear different voices in my corner as well, so we brought in Joel Diaz, who has a lot of experience and a lot of great advice. We've been in camp for six weeks. I love it out there. I'm extremely focused on this fight and we've been getting great sparring as well. This has been one of the best camps we've had in a while." "I can fight at 126 or 130. I've been sparring guys who weigh up to 155 or 160 pounds, so I've adjusted to 130 pounds. I can fight at either weight. Right now, I'm fighting at 130 pounds because I want to feel it out and because there are a lot of opportunities at this weight. There are also a lot of opponents for me at that weight, like Gervonta Davis, Abner Mares, Alberto Machado and Andrew Cancio. There are a lot of fights to be made at that weight." "It's been a while since 2017. In my last fight against Miguelito Gonzalez, I ended up tearing a ligament in my left thumb. We tried to fight through it, but I ended up having to get surgery in December 2017. We rested and were training for a fight in April 2018, but I ended up tearing fibers in my achilles tendon. So, we've just been recovering since then. "The back-to-back injuries were very frustrating. But we stayed in the gym and now something good has come out of it. We've been training hard. We've been sparring hard. Only time will tell if the layoff will affect me, but I'm coming strong and ready to win next week. Win, lose or draw, I'm always in a great fight. I always give a good fight for the fans, and I'm going to come and bring it. I'm going to give everybody an exciting show that night." "Me and JoJo [Diaz] have sparred a few times, so he knows what I bring to the table, and vice-versa. But fights are different. Come February 9, we will find out." "When I was an amateur, I did 100 fights. I was active the entire year. It's been three years since I've turned pro. My body has grown, and I've gotten stronger. I'm getting better. I'm just waiting for my moment. I'm just waiting for the fights to come. Then I'll show who I am." "2019 will be different. I'm going to give the best fights. Fans are going to ask for my fights. Everyone will want to see my fights. I'm going to give the most exciting fights so that everyone can see who I am. Delgado is a warrior. He likes to fight. He's only going to bring the best out of me, but I'm ready for that. I'm excited." "In my last fight, I went against [Golden Boy prospect] Jousce Gonzalez. It was a great fight. It was my comeback after being away for eight months. It was a close fight, and it could have gone either way. It was a draw, but now it's time to move on. We have Genaro Gamez in front of us, so it's going to be a good fight." "It feels great to be coming back. It feels great to get my rhythm back little by little after that tough lost against Charles Huerta. I took some time off. But it feels great to be back and get another opportunity." "The biggest change I've made is to train harder. I'm focusing more on my family; focusing on them makes me work even harder. They are my motivation. When I was defeated, I was slacking a bit. It was getting to me a little bit. But now I am more humble." "On February 9, I'm going to show that I belong here. I'm going to try to be one of the best prospects in my division. What makes Genaro Gamez dangerous is that he is undefeated. He's hungry to keep that undefeated record. I'm one of his toughest fights, so I've seen him training hard. He has a big following, and I know he doesn't want to disappoint his crowd. That's what makes him tough: he's hungry." 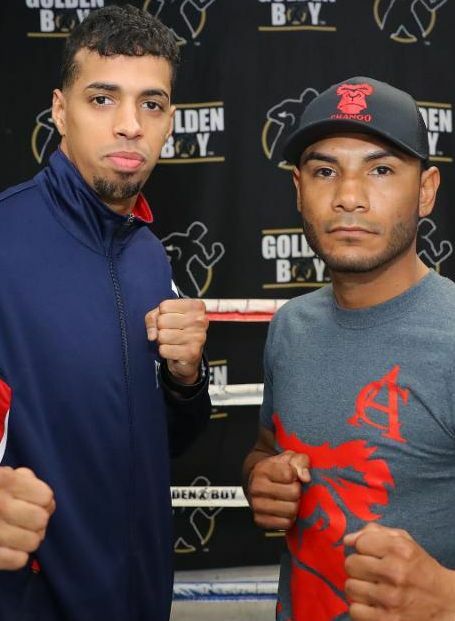 Machado vs. Cancio is a 12-round fight for the WBA Super Featherweight World Title presented by Golden Boy Promotions and Miguel Cotto Promotions. Vargas vs. Manzanilla is a 12-round battle for the WBC Super Bantamweight World Championship presented by Golden Boy Promotions in association with Promociones del Pueblo. The event is sponsored by Tecate, "THE OFFICIAL BEER OF BOXING," and Hennessy "Never Stop. Never Settle." The event will take place Saturday, Feb. 9, 2019 at Fantasy Springs Resort Casino in Indio, Calif. and will be streamed live on DAZN. Tickets for the event are on sale and are priced at $35, $45 and $55.Tickets will be available at the Fantasy Springs Resort Casino box office, by calling 1-800-827-2946, or by purchasing online at www.fantasyspringsresort.com. For more information, visit www.goldenboypromotions.com and DAZN.com. Follow on Twitter @GoldenBoyBoxing and @DAZN_USA. Become a fan on Facebook at www.facebook.com/GoldenBoyBoxing and https://www.facebook.com/DAZNUSA/. Follow on Instagram @GoldenBoyBoxing and @DAZN_USA. Follow the conversation using #MachadoCancio and #VargasManzanilla. Photos and videos are available for download by clicking here or copyingand pasting the link http://bit.ly/February9DAZN into a browser. Credit must be provided to Golden Boy Promotions for any photo and/or video usage. © 2019 GOLDEN BOY PROMOTIONS, INC. ALL RIGHTS RESERVED.